Standing on the top deck of the M/S Explorer that night was a wonderful thing. It was just after midnight, and the air was crisp and cold. The ice was sparkling, reflecting the ship’s lights, and even though the moon itself was bright, the sky beyond was much, much darker than we ever get at home. Without doubt we now could see more ocean and less ice when we looked down – a contrast from earlier in the evening when the balance was reversed. The sound of scraping and bumping along the ship’s hull was becoming less loud and less frequent as the large chunks of ice we had been going through for the past few hours began to thin out. The engines were gearing up for the open water ahead, and I had that funny surging sensation you get when you’re just about to get past a lengthy delay on the highway. The open seas were right there: finally within reach. All of this meant we were on the home stretch at last, and the next morning we would get to the continent itself. At this point I have to stop for a moment. Here, let me explain that this is the first time I’ve ever written this story. I’ve told parts of it countless times, and drafted it out in broad strokes, but actually putting the whole thing down in writing is a little more tricky. Now it’s as though I can’t skip bits, nor gloss over the parts that are still hard to think about without my chest tightening and the hair on my arms standing on end. It’s crazy, but even though the event has been banging around in my head for over five years, I can be right there in the moment in a split second. Sometimes I can tell the story and it’s just a familiar narrative, but other times, I get short of breath as I try to describe some small detail. The smell of marine diesel still makes me nauseous. Memory is a funny thing. Sometimes it’s all-encompassing. But, the story has to be recorded eventually, and now it’s time. So. There I was. Standing on the top deck of the ship, taking pictures of the moon’s reflection on the water, enjoying the relative silence, and quietly chatting with my friend Kerry, who was up there for the same reasons I was. It was exhilarating to be such lucky people at that moment! Then, all of a sudden, an ear-splitting siren shattered everything. My memory of what was coming over the loudspeaker gets a little blurry after that. It was the same thing over again – many times in many different words. Every one of them scary. So, we did as we were told. Kerry and I turned on our heels and went below deck to our cabins to get our warmest gear and our lifejackets. Not the lightweight, uninflated kind we wore for our outings on the Zodiacs, but the bulky, florescent orange ones that sat in the cabins, taking up space, smelling a little musty because they’re never used. The kind that mean business. I should probably remind you here that just before going up to the top deck, I drained the last of a glass of cognac, which had been intended as a nightcap. The taste was still on my lips, and my tongue suddenly felt furry. It was not a good mix with the uncontrollable surge of adrenaline I was feeling. I suddenly felt very drunk. I arrived in the cabin at almost the same time as my roommate, Toni. Without speaking, we started getting every possible layer on – with no idea what could be in store. Thanks to our evening in the lounge, we were not thinking very clearly. The captain was still talking, and now that we were at such close range the urgency in his voice was clear and penetrating – so loud and so insistent that it cut through my every thought like a knife. People were rushing both ways past the open cabin door – not panicking but speaking loudly and moving as quickly as possible in the small space, calling for each other and trying to establish themselves in the suddenly foreign hallways. After pulling on boots, which were a size too small (my own had cracked the day before, requiring me to get the only “extra” pair on the ship I could even remotely fit into) I suddenly thought about what might happen if we were to get into the lifeboats – which seemed so unlikely. Well, we might be bored. So I should get my iPod. As I reached into the drawer to pull it out, I saw my extra glasses, and decided those might be good too. And, oh! My waterproof pants might be useful. So I rolled them up and shoved the whole lot in my big pockets, unwrapped the ties from around my lifejacket, slipped it over my head and buckled it closed. Toni and I looked at each other again, took a quick glance around us at the cozy cabin – where our books lay open and our blankets had been turned back ready for bed, closed the door and went up to meet everyone else in the lecture theatre – the only place on the ship truly big enough for everyone to meet in the case of an emergency. We looked around the sea of orange for the faces of our companions, saw our friend Jerry and sat down with him at the side of the room. Our group of five was taking the trip because we worked for the tour company who owned the ship and ran the cruise. Amazing, unaffordable holidays were one of the few big perks we enjoyed. But, because of that, we were in a strange position with the other passengers; we weren’t working, but everyone knew we weren’t really passengers either. 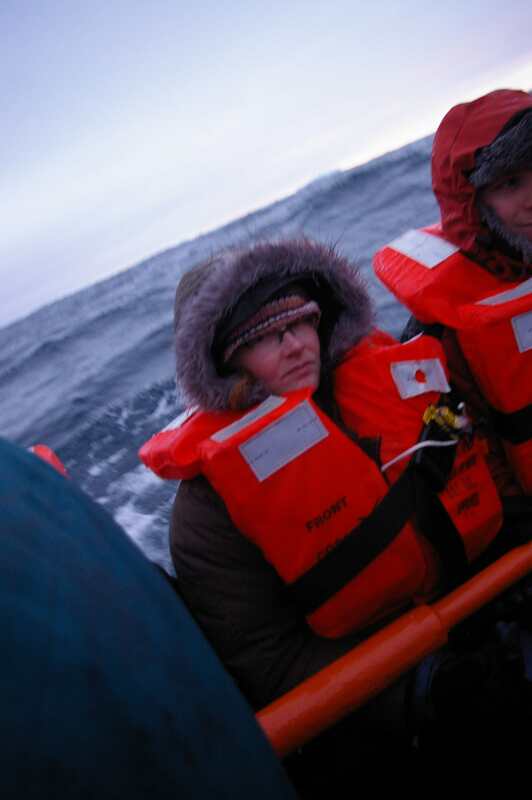 We sat down, with all of our layers on, hot and uncomfortable with the big, unwieldy, unfamiliar foam lifejackets stuck on top, making us itchy and anxious. People kept walking in, staring around wide-eyed before finding a spot to sit, or a friend to stand next to, and moving through the door. Everyone was counted by the staff – the expedition team were going about their jobs as if they were a well-oiled machine. Everyone was quickly accounted for, and one of the team stood up, grabbed a microphone and asked if anyone had any questions or needed any help. Some people had left their cabins in such a rush (due to water coming in!) that they didn’t have a chance to get their gear. One woman still had pyjama bottoms on. The remaining extra boots were put to good use, and everyone was asked if they had any clothing or gear they could spare. I remembered the waterproof pants in my pocket, and handed them over. I was so hot and uncomfortable with all of my layers already that I couldn’t imagine getting them on. And she undoubtedly needed them more than I did. Soon after, someone came around with clear plastic cups of sugary orange drink for everyone – presumably to help with the shock – and we all dutifully clutched them and sipped slowly. I put mine down on a nearby table for a moment, so I could readjust my layers, and then did a double-take. It couldn’t be true, but it looked as though the orange liquid wasn’t sitting properly in the cup. It wasn’t horizontal, like liquid should be. It was on a slight angle, climbing up one side of the cup. I stared at it for a while, thinking about what it meant. The members of the expedition team were still talking, trying to tell jokes and keep people chatting – but I had entirely stopped listening by that point. Then the captain came over the loudspeaker again. Everyone sat up as he told us what we already knew: we were in some pretty serious trouble. The ship apparently had a hole the size of a baseball about halfway down the starboard side. The hole went right through the strengthened hull – which I had considered a safety feature only weeks before while typing out a list of the ship’s features and history. Then, the captain explained that he had put out a Mayday signal – alerting all ships in the area that we needed rescue. Maritime law dictates that anyone who can help, must. And, because it is an international distress signal, he jokingly explained that the call had gone as far away as Italy – and the Italians had wished us well (but were obviously not in a position to help). He went on to tell us that the crew (many of whom had been working on the ship for years) had donned scuba gear and were trying unsuccessfully to patch the hole as we waited for a rescue. The words “mayday” and “rescue” hadn’t really been said until that point, and hearing them out loud was another jolt of reality. From then on, as the deck gradually became more and more slanted, we sat in our respective seats and, one by one, realized how much trouble we could really be in. The next hour was a blur of announcements from the captain, mostly saying that they were doing the best to get us help, but that the closest rescue ship was at least six or seven hours away. Despite the increasingly slanted decks, it was still impossible to accept that we would really be getting off the ship. At some point, we lost power. The emergency generator kicked in, so we still had lights (thank goodness), but it meant that the captain no longer had navigational control over the ship. It was travelling backwards, slowly, into the ice field we never truly escaped. Apparently the backwards direction on loss of power was a safety feature of some type, but while it helped avoid hazards ahead, it didn’t do much to help keep us out of harm’s way. Someone eventually opened the door to the back deck, and we made our way outside – walking was becoming difficult because by now the ship was on about a 60° angle – but gulping in the fresh, cold air woke us up from our introspective fogs. We all looked at each other with guarded smiles, trying to make the best of it by joking about how we had all known this was an adventure cruise – and that we were certainly getting our money’s worth! We eyed the lifeboats warily, trying not to imagine getting into them, cataloging what we managed to grab from our cabins. Some people had the presence of mind to choose useful things – wallets and cameras, medications and toothbrushes. Jerry even remembered his laptop! I, on the other hand, had my half-dead iPod and extra glasses. Sigh! Once it became obvious that we would indeed be getting into lifeboats, I suddenly realized that we should try to get to the toilet – after all, several hours in a lifeboat would be bad enough, but so much more horrible if we were desperate to pee. I grabbed Toni and we made our way below deck in about the most surreal moments of the entire experience. Stairs that had once been on a normal angle were now nearly vertical. We managed to get below deck, but coming back up was very difficult indeed. We heaved ourselves up using the handrail, with our feet climbing the stairs as if it were a ladder. Less than five minutes later, the captain caught our attention again over the PA system. In an urgent voice, he explained that for the past half hour the starboard side of the ship had essentially been stuck to a growler (big chunk of ice) – which was large enough to prevent our lifeboats from being lowered on that side. Since we needed all of the lifeboats to function properly, and because he had lost navigational control of the ship, it had been a serious situation. But now came the words we’d all been dreading: it was time to get into the lifeboats. It still makes me feel a little ill to remember it. But we knew what to do and filed to the lifeboats, where the crew met us. Seeing the men and women who usually kept the ship running all in one spot was rare- for the most part, we saw them in ones and twos as they went about the business of keeping us fed and well taken care of. There was no stampede, and no panic. Nobody seemed to remember which lifeboat they had been assigned two weeks earlier, but it was still orderly as we found a spot to gather. The boats themselves had seemed perfectly adequate only a couple of weeks before, but now we noticed that they didn’t have covers over them. Which meant we would be exposed to the elements for as long as it took to be rescued. The situation seemed a little more dire. I happened to get into the first lifeboat to be lowered down the side of the ship, and as we hit the surface of the water, a big sploosh came over the side, soaking my back and legs, going right up underneath my many layers and chilling me to the bone. I immediately regretted giving away my waterproof pants! Once in the water, we had to get out of the way of the other lifeboats, so they too could be lowered safely. We pushed off using one of the massive, heavy oars as the crew struggled to get the old-style pull-motor engine started. After what seemed like forever, black smoke belched out of the engine’s chimney style exhaust and we all breathed a sigh of relief. We moved away from the other boats, which were now coming down the side of the ship fairly quickly. Our group was pretty brave – most people were travelling with someone and we were all supporting each other. I remember grabbing one of my colleagues’ hands and gripping it with white knuckles as I shivered and tried to deal with the fact that we were now adrift in the Southern Ocean with a rescue at least 5 or 6 hours away. The weather was cooperating, not too cold at minus 5 degrees Celsius (23°F), and although we had been through a crazy snowstorm earlier in the day, we were lucky to have a clear night. But by now I was feeling the sploosh of icy water with full force, and anxiety was making me colder than ever. The sickly taste of cognac was still in the back of my throat, and the smell of the diesel engine was nauseating. Unfortunately the water was a little rough- there were no big waves, but there was a fairly large swell; big enough to normally prevent us from going in the Zodiacs. Of course, we didn’t have much choice. So we just tried not to fall in or get seasick. The group was still stoic, if not particularly chatty. At one point, a colleague decided we needed cheering up and started to sing “Here Comes The Sun” to get people singing along. It didn’t go well – and I’ll admit to being not very nice about it – so she eventually gave up. The lifeboat was too crowded to really move around (plus the giant oar we’d used earlier was resting across my lap) so I felt a little trapped. And a lot cold, and a lot scared. In manner of distraction, some of us continued the “what did you manage to get from your cabin?” game. And, on spying a large, very full duffel bag, I was most impressed – but the staff member who was clutching it quickly shushed me: she was the ship’s purser, and the bag held all of our passports! Amazing! (The purser kept them so that when we entered a new port, they had all the passenger documentation on hand). I nearly kissed her. The next hour or so was a bit of a blur. I remember white knuckles beneath my mittens, a freezing cold and soaking wet back and legs, and the feeling of being trapped by the oar. The other lifeboats were all in the water by now, and the Zodiacs had also been lowered. All the crew and passengers were off the ship, apart from the captain and the expedition leader who remained on board so they could communicate with the now urgent rescue operation. They kept us as informed as possible through portable radios, but there wasn’t much to say by that point. We just had to wait. As we did, the inky darkness started to turn into a greyish light. Since we were so far south and it was so early in the season, the nights were very short indeed. Despite it being the middle of the night, we could see the whole scene before us, under the overcast sky. It helped. Later, one of the crew pulled up in a Zodiac beside our lifeboat, offering to take anyone who wanted to go into the smaller craft. Taking the opportunity while it was there, I grabbed Toni, and with the help of lots of people holding the sides of the boat, we clambered over into the Zodiac. Kerry, then Angela and Mike, a couple I’d chatted with earlier on the trip, joined us and we were five. Nobody else would come along. It was a little colder in the Zodiac (we were sitting on the metal bottom of the boat, floating on the freezing cold water), but it was good to stretch our legs out in front of us and not feel trapped by the oar. And the smell from the engine wasn’t quite as strong. Overall, much better! There still wasn’t much to say, so we just sat quietly in our own little personal worlds. By this point, I had started to go through the events in my mind, and got stuck on the part where the Italians had wished us well after hearing our mayday call. Then, I realized anew, the news was out – a passenger ship going down is a big story; one in Antarctica would be quite sensational. It wasn’t that I cared to be an international news story: in fact, quite the opposite. I had simply realized that Europe would be waking up to the breaking news about the ship – and that some of my English relatives might hear about it first. Unhappily, I imagined my parents getting a phone call in the middle of the night to tell them that my ship was sinking. All I could think was how they might react. My mum had already been apprehensive about the trip and I remembered telling her about the safety features, and how the ship was designed for Antarctica, and that I would be just fine… but there I was, unable to reassure them that I was safe. Would one of them have a heart attack? Would they go crazy with worry? It was an absolutely dreadful feeling, and from that point forth, I couldn’t really stop the tears sliding out of my eyes. At some point – after perhaps two hours – someone discovered that there were “emergency survival suits” in a pocket of each of the lifeboats and they were tossed to everyone who wanted them. They weren’t really “survival suits” per se – they were more like large sacks made from tarpaulins, lined with that reflective material that’s supposed to help maintain body heat. They each had a hood and a zipper going up to the chin. Most of us had gratefully accepted the extra layer – we were now very shivery – and after clambering into the survival bags and getting the zip up over our lifejackets with some difficulty, we discovered simultaneously that the zippers were rusted and were practically impossible to pull down. They would have been better described as “body bags” because if for some reason we had ended up in the water, we would have sunk like stones. So, there we sat, each feeling a little isolated, trying to wrestle the zippers down – whilst maintaining body heat and struggling to control our emotions. It was a low point, and nobody had anything good to say, so nobody said a word. For the next hour or so, the silence was only punctuated by one or another of us being sick over the side of the boat (by now the diesel fumes, and the swell, and the stress were adding up to a pretty toxic combination). It was Angela who eventually broke the silence, asking in a loud, clear voice: “Would Anybody Like A Mint Imperial?” It was the perfect counterpoint to the quiet. We all fell about laughing. For a few minutes we lost our inner dialogues and felt some companionship. Apparently, she had spent ages carefully counting the mints before offering them- anxious to make sure she had enough for everyone. Everyone gladly accepted, eking them out for as long as we could. With the mint in my mouth, I felt a little better, and between the tears I was still powerless to stop, I started to think about my life. Sitting in a lifeboat waiting to be rescued provides an almost unparalleled opportunity for self-reflection. I realized with extraordinary clarity that I needed to change my direction, and fast. I hadn’t been happy for a very long time, and I knew that many of my frustrations would disappear if I went into business for myself. I’d been toying with the thought for a while, but this was the kick in the pants I’d needed. Now it was time. As the night wore on and it became more and more light, our amazing Zodiac driver kept us out of harm’s way. We were in open water by this time, but the swell was still quite impressive. Had we ended up in the icefield again, we would have been in danger from the large chunks of unforgiving glacial ice that could have swamped or crushed our Zodiac. He kept us safe throughout. He must have been exhausted, and thinking of his own family, but he refused our help and continued to smile. His amazing attitude and ability to remain calm helped us manage, too. Several hours into the night we were thrilled to hear the sound of a helicopter approaching. Of course, much like the Italians, it couldn’t do anything to help, but seeing and hearing it above us was wonderful. We knew it really was happening now, and started to see beyond the black, undulating sea that had been our companion for so many hours. Despite earlier reassurances from the captain, it was very comforting to know someone had actually seen us and knew where we were. At last, someone pointed to a pinprick of light on the horizon. It really was no bigger than a pin, and we couldn’t believe it at first, but it didn’t go away. In fact, it seemed to get very slightly bigger. Our hearts leapt as we watched the slow progress of this tiny little light. It was small but strong, and getting stronger by the moment. Eventually, what seemed like hours later (though it was impossible to tell), we could no longer deny that rescue really was on the way. The light we saw was the morning sun reflected on the bow of the rescue ship as it made its slow progress towards us. From that point on, our strange fog started to lift. We were out of limbo and could speak to each other again. All of us could finally imagine how wonderful it would be to get out of the Zodiac and out of our body bags. That ship couldn’t move fast enough. As the light got closer and closer, we started to realize that not one, but two ships were en route. It was a wonderful, wonderful feeling to know we would soon be safe, and the radios were going mad with crackling excitement – our captain had long since abandoned ship himself, so we didn’t have his familiar voice to keep us company, but we didn’t need it. We had rescue. By the time the ships reached us, we could see that there were two very different vessels – one was the Nordnorge, a large cruise liner (as compared to our own little red ship) from the Norwegian company, Hurtigruten. A welcome sight, because we could see that it could easily accommodate us. The other ship was a smaller vessel: the National Geographic Endeavour. People with cameras were leaning out and waving to us – it felt like we were providing a photo opportunity. One by one, our lifeboats and Zodiacs approached the Nordnorge, and in a flash of orange, each lifejacketed passenger was pulled to the safety of the ship’s own, sophisticated-looking, covered, lifeboats. Once full, the boats were hoisted up the side of the ship, the passengers released, and the process began again. Ours was one of the last Zodiacs to pull up to the lifeboat, and the relief when we were finally yanked from the sea was absolutely overwhelming. As each person was deposited on board the lifeboats by the Nordnorge staff, we marvelled at how different the experience would have been if we had these modern vessels instead of open boats, with smog-belching engines, unwieldy oars, and inadequate body bags. It was a revelation and we began understand how incredibly lucky we had been to get through it all unscathed. Once our full boat was pulled up out of the water and the door opened, we felt extraordinarily safe. We were met by an empathetic woman with a clipboard, who counted us as we walked, dazed, onto the big ship; directing us along a hallway, where we were each draped in a blanket and offered a hot drink and (bliss!) shown the way to the toilet. It’s hard for anyone to imagine how we felt. Once the immediate concerns were dealt with, we were shown to a box of warm, dry clothing and told to help ourselves. The whole deck level had been blocked off for us, and despite the early hour, the kind staff had opened the bar to all. We all cheered loudly when the captain stood up to speak – I don’t remember what he said, just that it was amazing to hear his voice in person, not through the scratchy radio or intimidating loudspeaker. The feeling in the room was indescribable. We were elated and still surging with adrenaline, and though it took hours and hours to stop shivering and feel truly warm again, it did eventually happen. The staff and passengers of the Nordnorge cannot be thanked enough for the effort they went to to make us feel safe and welcome. They had been going full tilt all night to reach us – apparently the ship was creaking and groaning with the speed – and they made announcements to the passengers asking if anyone could spare warm, dry clothing, resulting in several giant boxes of clothes. Some passengers had apparently even insisted that the ship open the little store so that they could buy extra layers for us to use. It was incredibly touching. I found a pair of trousers at least 5 sizes too big, but they were warm and it didn’t matter if I had to tuck them into my underwear to keep them on. My own gear was laid out to dry and we were told to go and get breakfast, which was put on specially for us. The atmosphere was jovial and friendly – we were thrilled to finally be able to feel some release. One very funny thing happened as we lined up for breakfast. We were a motley group in our odd assortment of gear – some people still had their blankets on, some had on wellington boots, many of us were just in socks, and all of us looked as though we’d spent the night in a lifeboat. But, there was one person who didn’t look quite right – she looked well-rested and clean, and none of us had ever seen her before – she was clearly one of the Nordnorge passengers. Somehow, almost unbelievably, she had managed to miss all of the announcements and excitement, and had lined up with us for breakfast without realizing why we were there. She was mystified by our appearance, and asked in an unmistakably southern drawl, “Where did you guys get on? I got on in Ushuaia”… it was the comic relief we needed, although she had no idea why we found it so incredibly funny we all fell to pieces laughing. The Nordnorge was huge compared to our little red ship, and we were given free rein to explore as we wished. I was still desperate to get in touch with my family to let them know I was rescued. Somehow I found the computer room, and some kind soul gave me enough internet credit to email home. I sent one off, hoping it would reach them, but there was no indication that anyone in Canada knew we had even been in distress. It was a relief but also a little bit of an anticlimax. I decided, randomly, to email Sue, one of my closest friends at work – so she would know that we were safe. I described the experience as “sitting in a frozen plastic bag, bobbing around on the ocean”. Little did I know that it was one of the few emails the company had received, and it would eventually end up as a headline quote in our national newspaper – where my parents instantly recognized it as mine, despite it being attributed to an unnamed staff member. After sending my emails, I wandered around the ship and came across a lineup of fellow evacuees, who explained they were there to use the SATELLITE PHONE! I was thrilled. We were each given one minute to tell our loved ones that we were well- by this time it was around 8 or 9am for my family and I was desperately hoping they knew I was safe, but knew they wouldn’t believe it until they heard my voice. I still can’t even think about that short conversation without a huge lump rising in my throat and tears prickling my eyes. It was so good to hear that they were both OK – but the tone of my Dad’s voice as he established that I was also fine was almost too much to bear, and I could hardly speak. I didn’t even take my full minute but I had the answer I needed: they were safe, too. After that, nothing really mattered to me. It was now just a waiting game. We spent the rest of the day chatting and relaxing, trying to get warm, having a well-deserved drink, and looking out of the windows – the weather had turned and we were in the middle of another storm. Nobody really talked about it, but once again, we realized how lucky we were. For several hours the Nordnorge stayed within sight of the Explorer – which was, by now, completely on its side and a bizarre, unsettling sight. But, eventually, the Chilean coast guard took over, and we learned later that she sank about 15 hours after our initial distress signal went out. We were scattered throughout the ship by this point, exploring foreign territory in our socks, occasionally coming across “one of us” and comparing notes. I heard many stories of random acts of kindness; some of the Nordnorge passengers had allowed our group to use their cabins to shower and rest – some, like me, had been given internet credit. The event really brought out the very best in people and we felt (still feel) quite blessed. Someone came around at one point giving out a handful of toothbrushes – I took one – but then found I had to share it with my friends. Luckily someone else had found some toothpaste, and we all just made the most of it. Sharing was better than furry teeth. Soon, it seemed, it was dinnertime, and the Nordnorge needed to get back on her own itinerary, so we were told to eat and get ready for the next part of our journey. We were to be taken to the closest possible place of rescue – a research base on King George Island. We didn’t know what to expect beyond that, but by now the weather was brutal, and we were grateful that the Nordnorge was so well-prepared. We donned modern survival suits, designed to keep us warm and dry for hours, and followed a seamless procedure – we were loaded onto (and tethered into) speedboats that took us the short distance to the shore, where we were met by smiling Chileans and loaded into all-terrain vehicles after returning our survival suits to the Nordnorge staff. We had been split into two groups by this point – one entirely made up of passengers, led by a few members of the expedition team, and another, my group, made up of crew, some expedition staff and our team of staff travelling on holiday. There were, due to the sheer number of us, a handful of regular passengers with us too. The two groups separated and we went to two different bases. Our group was welcomed with hugs and smiles by a very friendly group of Uruguayans, who had enough bunks in their dorms for almost all of us to have our own beds. We stayed in the cozy lounge for as long as possible, enjoying the solid ground and the warm welcome. Some people answered phone calls from reporters, who were desperate to hear our story, but most of us just sat around marvelling at the events of the past 24 hours. The TV was on, and we had the strange experience of seeing ourselves on the news – it was quickly obvious that the helicopter we had seen so many hours before had been taking pictures of us bobbing around, but the same three or four pictures were on every few minutes and soon became just another surreal part of the experience. We tried to sleep that night, and eventually did, but we all had the same experience – when we lay down and closed our eyes, we could still feel the swell of the ocean and see the inky waves all around us. Our dreams were full of the same. But, no matter, we were safe. The following day we were, again, in a strange limbo. We went back to the lounge and tried to pass the time by watching movies, but it was obvious we couldn’t stay where we were for long, and we were now becoming anxious to get on our way home. We had no idea when or how it would happen. Of course, behind the scenes, a massive group of people were working around the clock to get us home; plans and negotiations were happening at a rapid pace, and we eventually had to leave our cozy lounge and head to the base where the other passengers had just been. As we approached, we heard a loud engine roar as a Hercules airplane took off with all the other passengers, who were now en route to Punta Arenas – and eventually their own homes. We spent another night on King George Island, thanks to the hospitality of the Chileans, who fed us and housed us in their gymnasium. By the following morning the novelty of the situation had entirely worn off, and we all wanted our own toothbrushes and a change of clothes more than almost anything else. It wasn’t long in coming – we heard the sound of the Hercules long before it touched down – and with it came a group of officials, who stamped our passports (which we had now retrieved from the purser’s duffel) and processed our entry to Chile. We trooped onto the plane – which, having been designed for military use – was like nothing we’d ever seen before. We sat, not facing forward, but inwards, strapped into five-point seatbelts, staring at the people directly across from us. It was bizarre. And loud. And very, very cold. After what seemed like an age, but was probably just a few hours, we landed in Punta Arenas, many of us still clutching our lifejackets – which we’d become strangely attached to by this point. We were met by yet another bizarre sight – a wall of cameras and reporters waiting to talk to us and hear about our experiences. The long walk from the aircraft to the terminal building was punctuated by flashes going off, and yells of “senorita! senorita!” which was slightly unsettling as I wasn’t at all ready to talk about it. Making our way into the terminal, I saw with great joy that my good friend, Steven had come to oversee the operation – he had flown down from Toronto immediately on hearing the news and had taken charge of ensuring the many embassies were there for us if we needed them, had organized the insurance people and was there to welcome us back to dry land. I felt the lump in my throat rising again, but this time I could swallow it back and smile with happiness and total relief. Getting home was now much more easily imagined. We were bussed to a local hotel, taken straight to a small dining room, and given a welcome meal, with bottles and bottles of delicious Chilean wine. We celebrated, well, just as if we had just been rescued from a sinking ship! It was incredible. At the hotel we met several other friends and colleagues – Sean and Daniel were there, fielding questions from everyone, making sure Rich, and Britt, and the rest of the folks at head office knew what was going on so they could coordinate repatriation efforts for the enormous group of passengers. Seeing the friendly, familiar faces was like being given an enormous, comforting hug. It was lovely and none of us will readily forget it. After we’d had our fill of dinner – and more than enough wine – we were given a bag of essentials (a toothbrush and toothpaste of our own, a pair of underwear, a night shirt, socks, deodorant – all the things we’d been wishing for). And then Steven stood up and announced that we had 20 minutes before a bus would take us to a nearby department store to get anything else we needed. It was Sunday by this time, and the store was open just for us. The insurance company had given everyone a small allowance and free rein to do with it as we wished (excellent news for those of us who only had extra glasses and dead iPods instead of our wallets). Twenty minutes later, we were on the bus, singing lustily as we made our way to the department store, much to the amusement of our driver – and the store’s staff, who handled our arrival with remarkable grace. After all, they probably hadn’t had too many tourist groups arriving en masse, singing and tipsily swaying, arms around each other’s shoulders, shamelessly stripping down to their underwear in the middle of the aisles as they yelled about needing “mas grande” jeans. It must have been quite a sight. After we had what we needed (a pair of running shoes was now a welcome relief for my sore toes), we headed back to the hotel and enjoyed long hot showers and the chance to make collect calls to our loved ones. It was all starting to come together at last. Eventually, on Tuesday morning, five days after the sinking and after a couple of flights – and near misses of stand-by seats – and all sorts of drama, we walked off the plane in Toronto with our orange lifejackets still in our hands. We were met by our families, and our lovely colleagues; Sue and Brad – who we greeted with huge hugs and loads of tears. Even the owner of the company was there. It was quite momentous. And, finally, over. The next few months were spent trying to get back to normal after our experience. It was hard for us to explain at first – and it was particularly tough when people would ask things like “what was it like?” or “was it scary?” or “was it cold?” Answers that would have required lengthy explanations – but often only warranted a glib response. We all handled it differently – some of us seemed more capable at first, but none of us were unaffected. We all seemed to use the experience as a catalyst for change in our lives- realizing that we had an opportunity that most people never have: a before, and an after. This story has been waiting to be told for over 5 years, but I haven’t been able to actually write it down until today, and it was tough. It came at a price – my eyes are puffy, and I’ve been up all night – but I am happy to finally share the story, and I hope you found it interesting. I’ll admit I’ve had happier moments. If you’d like to read about the rest of our trip – which was wonderful, if perhaps overshadowed – please click here.